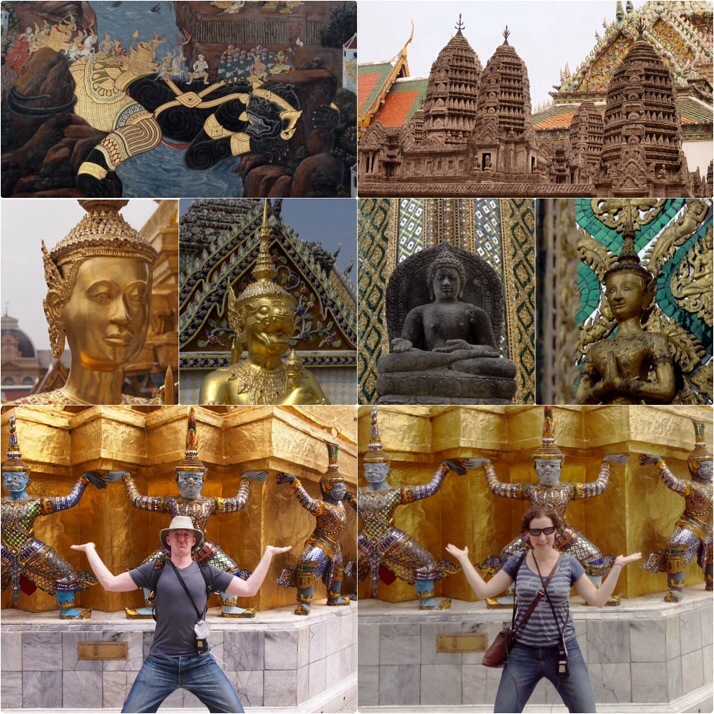 As we made our way from Chiang Mai in northern Thailand, via Sukhothai, toward the southern island of Koh Lanta, we stopped once more in Bangkok to visit a couple of sights we missed the first time around. 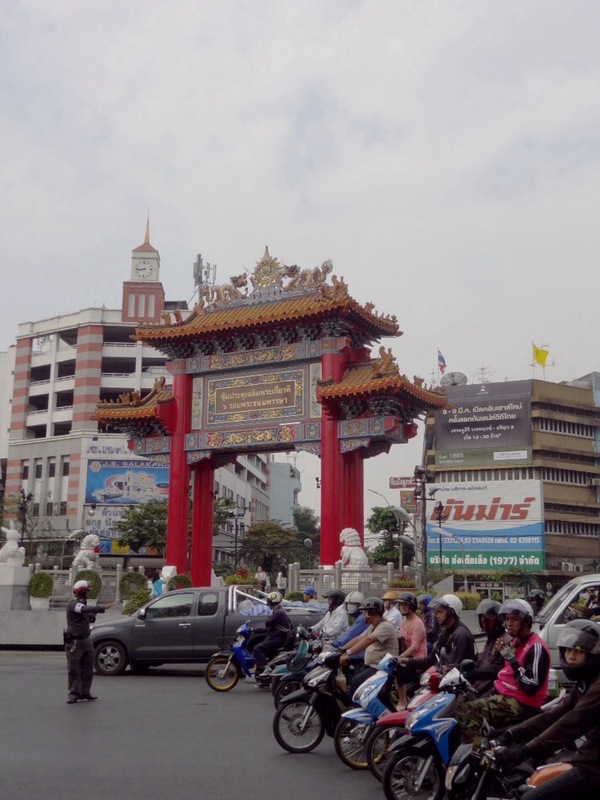 As our good friend Khun had given us such a great introduction to the capital of his homeland, we felt a little like we were returning home – somewhere familiar, somewhere known. Since we were here last when the anti-government (and anti-corruption) protests had just started, Thailand has held a general election which was disrupted enough so that any result will undoubtedly be contested, leaving the country in political stalemate. There were less people on the streets in the centre of Bangkok this time, and where crowds of protesters once sat, street stalls selling food or supporters garb lined the enforced pedestrian thoroughfares. T-shirts bearing the slogan “Shutdown Bangkok, Restart Thailand” piled high, and wearing the colours of the national flag is synonymous with supporting the protesters goal of a temporary suspension of democracy. 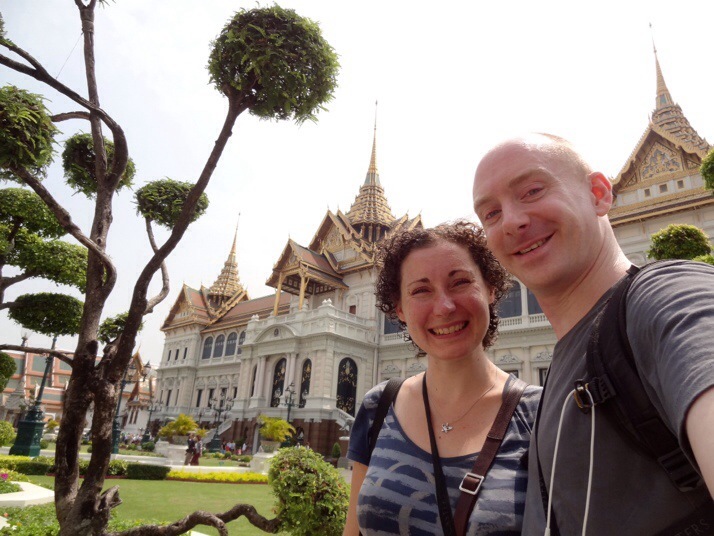 Next door to the stunning Wat Pho we saw on our first visit to Bangkok, the Grand Palace was the residence of the Kings for 150 years after it was built in 1782, and is still used for royal and official ceremonies throughout the year. Within the grounds is Wat Phra Kaew, and the combined audio guide tour took us through this compact, temple-filled splendour first..
Wat Phra Kaew. Gold, gold, everywhere! The undisputed highlight of Wat Phra Kaew (and that’s saying something!) 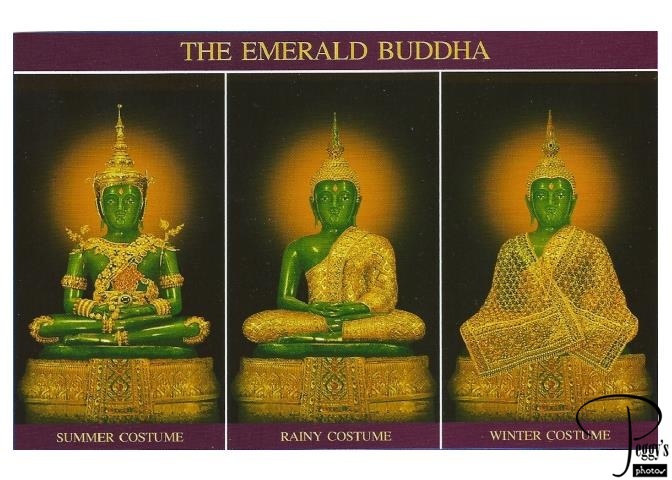 is the Emerald Buddha. Thought to have originated in India, it was hidden for 300 years and only rediscovered in Chiang Rai after the chedi it was hiding in was struck by lightning. 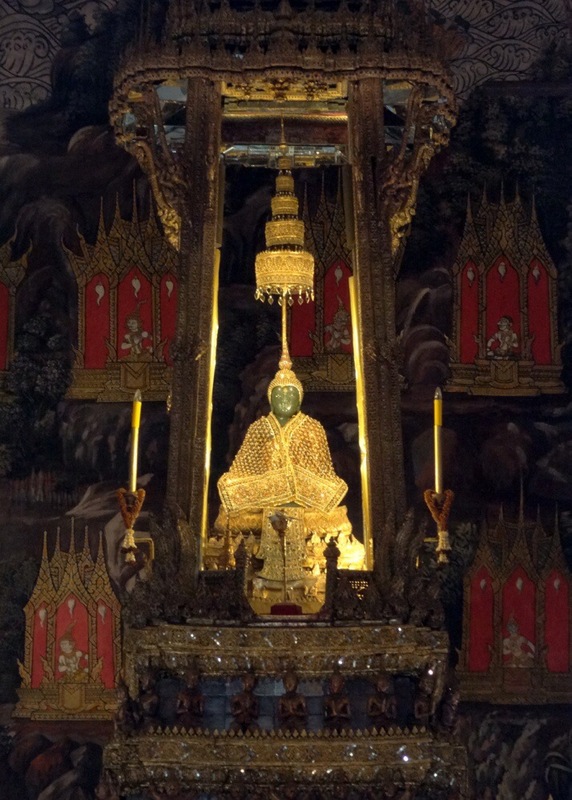 The figure was moved briefly to Chiang Mai, then Sukhothai and now sits in contemplation and for adoration atop a golden throne. The Emerald Buddha. Photos are not permitted from inside the temple, but if you have enough zoom they helpfully leave the front doors open.. 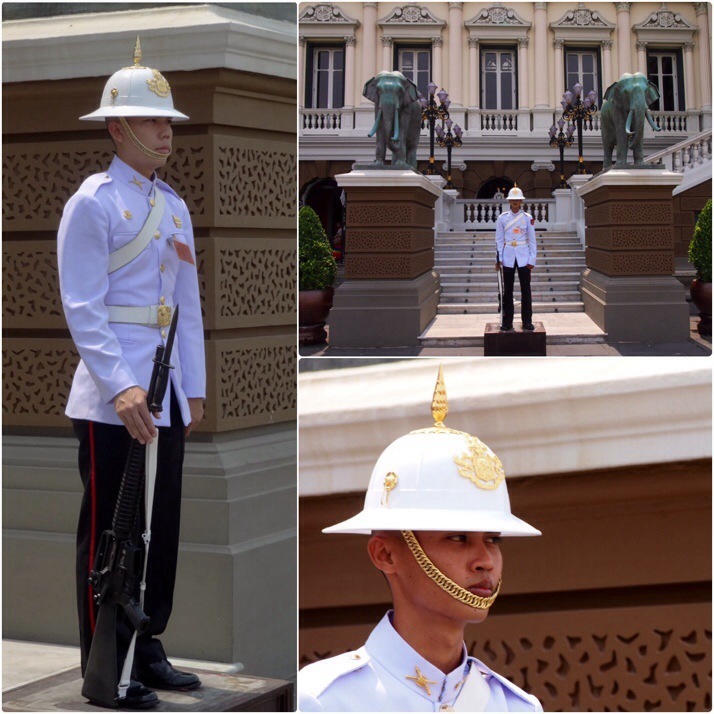 In a very elaborate ceremony timed with the seasons, the King climbs a staircase behind the throne, and changes the Emerald Buddha’s outfit. 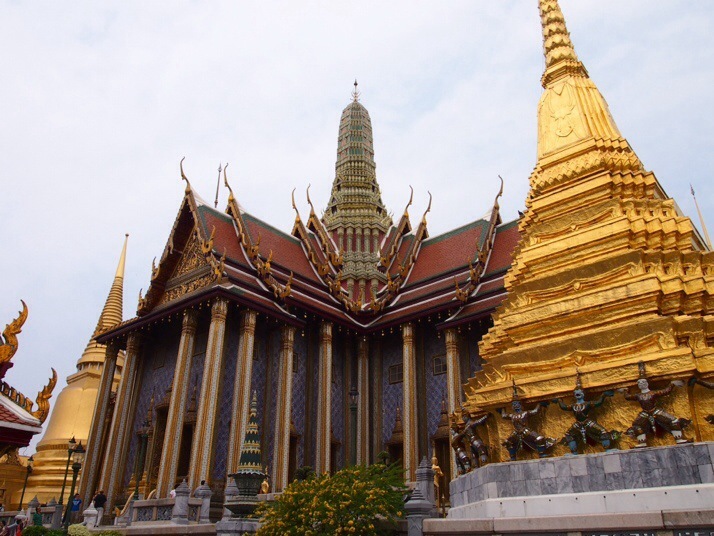 After Wat Phra Kaew, the expansive Grand Palace is a welcome contrast to the claustrophobic golden glitziness. Although the splendid main palace building is closed to all but invited visitors, there are two open galleries on the ground floor either side of the central staircase. The left gallery houses a collection of ancient fighting weapons – spears, maces, axes and swords, and the right – cannon, muskets, pistols, and rifles, including several made in England. There was so much to see that we used most of our 2 hour audio guide allowance in the wat, and had to rush the end of the Grand Palace – on reflection the balance was about right, and although we feared an extra charge for the late return of the equipment, we weren’t fined for being 15 minutes over. 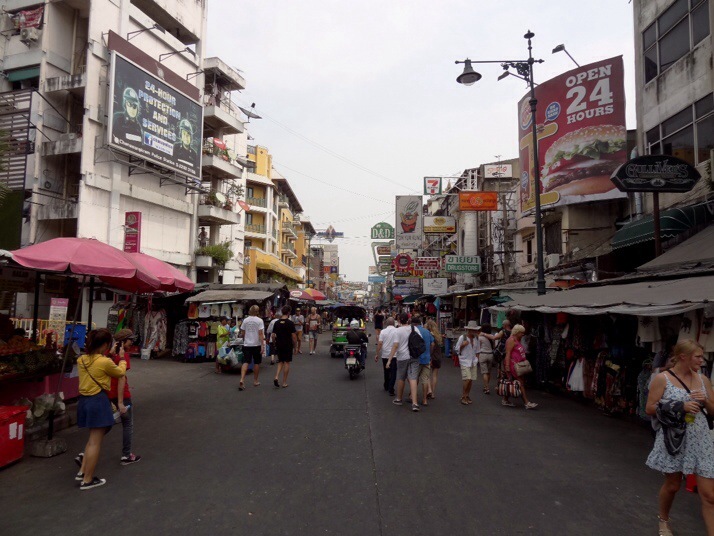 Khao San Road, commonly abbreviated to KSR, is the most well-known and most tourist-orientated street in Bangkok. The roadside is overflowing with souvenir stands, bars, cafes, restaurants, massage parlours and a couple of small shopping centres, and the higher storeys are mostly taken by hostels and small B&Bs. Khao San Road (KSR), a good place to stop for a beer, a (weak) cocktail in a bucket, and/or a massage! One of the first things we try to do in a new place is have a walk about to get our bearings, and we often like to achieve this with a walking tour as it also shows us places we may not otherwise have found on our own. 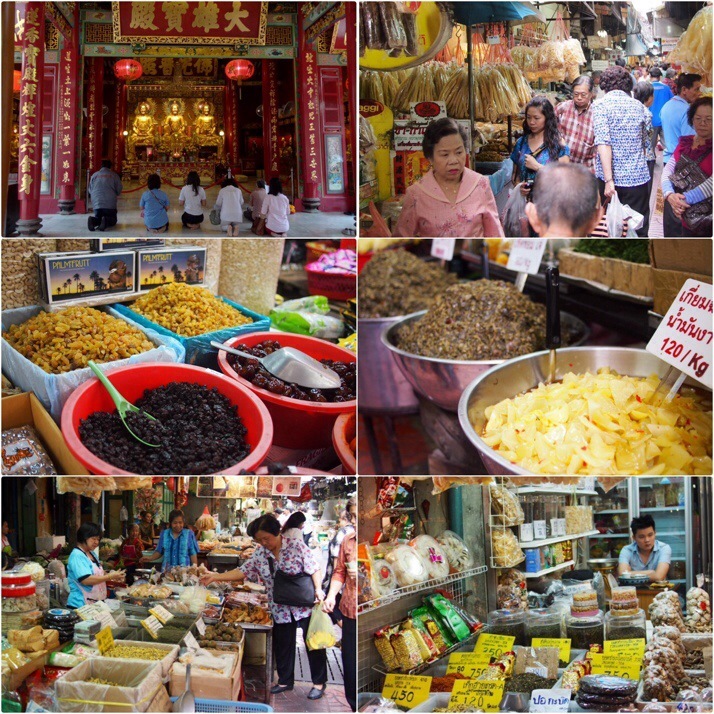 The Chinatown area of Bangkok is a sprawled mass of backstreets and alleyways full of retail shops and wholesale merchants counters. 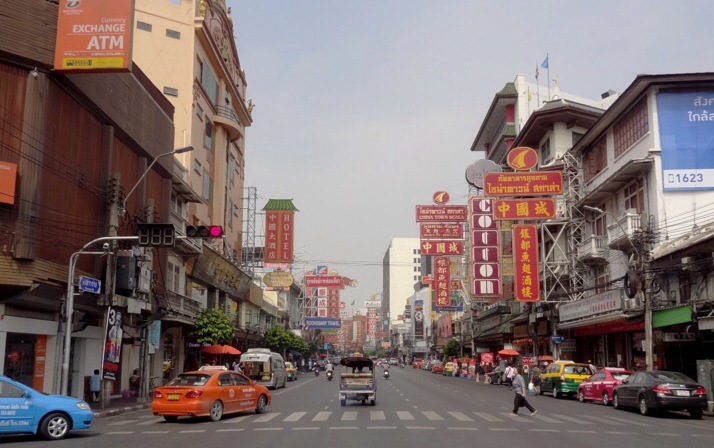 As we first saw in Beijing, Hong Kong and also old Hanoi, each street specialises in a given item – shoes street, clothes street, ingredients street, toy street, etc. as most of the shops were devoid of customers, and with pretty much the same array of goods available in each of their neighbours, we pondered how they could all stay in business. This was one of the hardest walking maps we’ve ever tried to follow – we’re used to heading up small streets then backtracking but there were 3 occasions that we found ourselves a street away from where we should have been! Still, it was good fun getting lost in the narrow busyness. 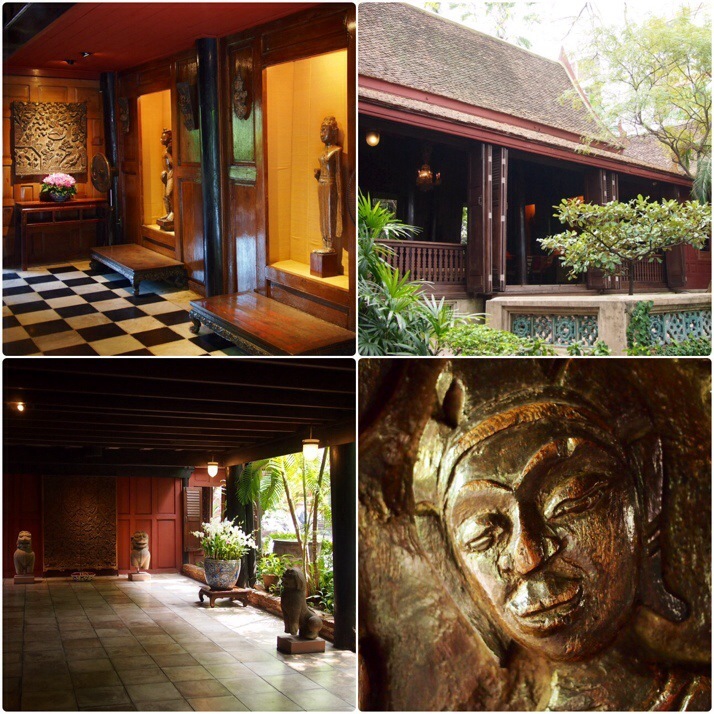 Reading the reviews of our hotel in Bangkok, a few had mentioned that it was close to the Jim Thompson House, so we did a little bit of research and as our overnight train left late in the evening, we decided to see what it was all about. 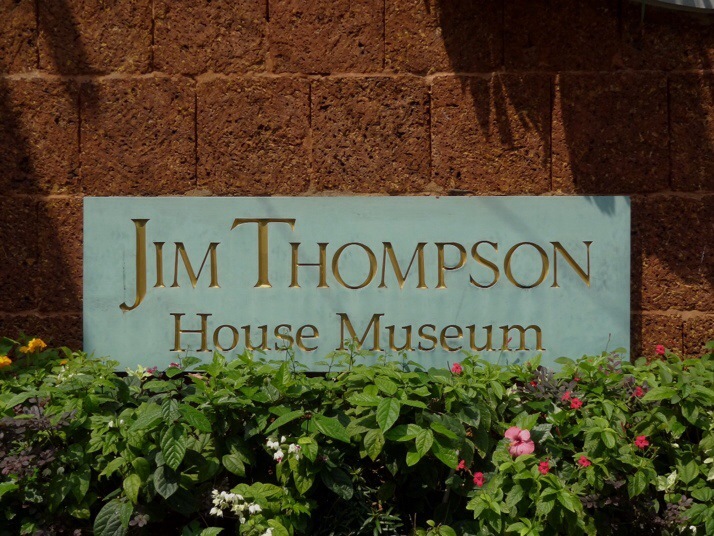 To briefly summarise Jim Thompson’s story, he is credited with almost singlehandedly reviving the Thailand silk trade in the 1950’s and 60’s. Then, on a trip to Malaysia in 1967 he reportedly went for a stroll and never returned. Almost 6 months after his disappearance, his elder sister was murdered in her home in the US. To this day his body or whereabouts remains a mystery. The house is unusual for Thai residences because it’s actually made of 6 native Thai houses joined together. Mr Thompson had them moved from different areas of Thailand and rebuilt across the river from the families and factories that manufactured his beloved silk, using the extra space to store the collection of Asian art gathered on his travels. He was a man of great taste, and his collection is a delight to walk around. I particularly liked that when rebuilding the houses he had some of the walls reversed so he could appreciate the beautiful fretwork from the inside. This entry was posted in Places and tagged Bangkok, Market, temple, Thailand on March 12, 2014 by Andrew.